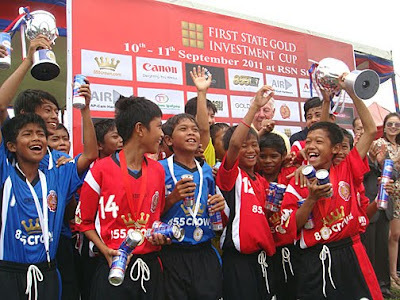 The Phnom Penh Crown Academy are the first winners of the First State Gold Investment Cup after this morning's fabulous final was beamed live to homes across Cambodia by the TVK television channel. 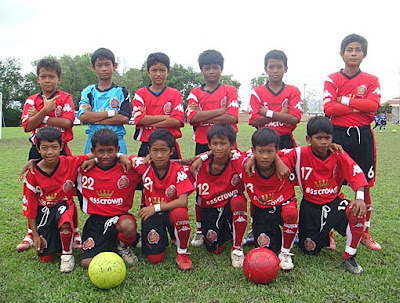 But then again it was guaranteed that would happen after both of the Academy teams, PPCFC1 and PPCFC2, had won through yesterday's round-robin games to reach today's final. The hero of the hour turned out to be one of the smallest players taking part in the tournament, Vat Samnang, who hails from Battambang, and who turned 13 years old in May. Small in stature but big in heart and with a right-foot that adults would be proud of, his equalizer with two minutes of the final remaining was a stunning 25-yard strike that sailed into the top corner. It gave heart to his team, PPCFC2, and in the first minute of extra-time, he was on hand again to fire home what proved to be the winning goal for PPCFC2, who won 2-1 and celebrated by picking up their two-goal hero and throwing him into the air. 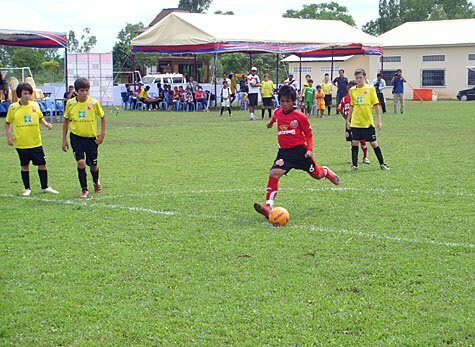 The match proved to be a great advert for U-13 youth football and was a fitting finale to the cup competition that had welcomed the International Soccer Academy from Singapore to join with five Cambodian teams on the final day of action. The PPCFC1 team started the 10-minutes each way final with a point to prove after they lost 1-0 to their Academy teammates in the final match of yesterday's games. Yeu Muslim and Phoeun Sopheak both struck the woodwork early on and In Sodavid rounded the keeper but failed to find the finishing touch. In the second minute of the 2nd half, Sopheak found Mat Sakrovy in space and he made no mistake from close range to put PPCFC1 in front. That galvanised PPCFC2 into action and Vat Samnang and Seut Baraing both went close before Samnang's stunning strike from distance levelled the scores. 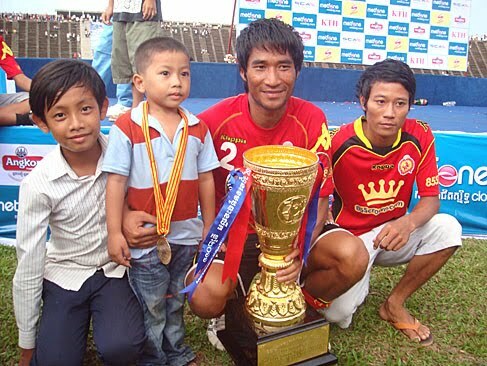 In the first minute of four minutes extra time, Samnang stole in to score his second and PPCFC2 held out with keeper Kim Chhaya denying Yeu Muslim twice in the closing seconds. 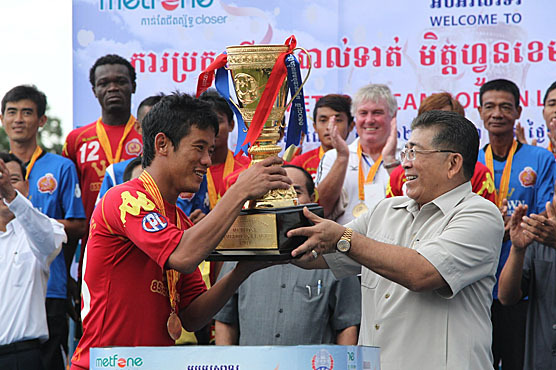 Cue the celebrations and presentation of the trophies by the guests of honour including FFC deputy president Khiev Sameth, former Chelsea manager Ken Shellito and PPCFC president Rithy Samnang. The ISA academy boys claimed third spot after beating CFO in their 3rd-place play-off, though every player that took part received a medal. 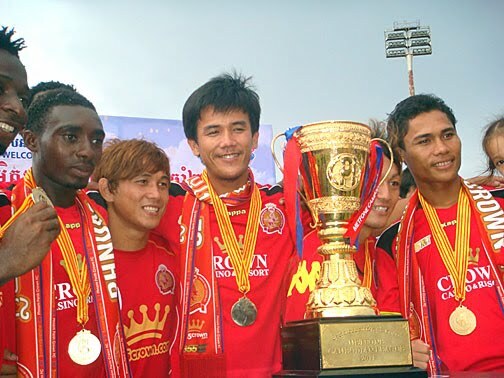 Captain of the PPCFC2 team, Sraing Titchhy collected the main trophy as he and his teammates jumped for joy, soon joined by their PPCFC1 colleagues, also showing off their runners-up trophy. 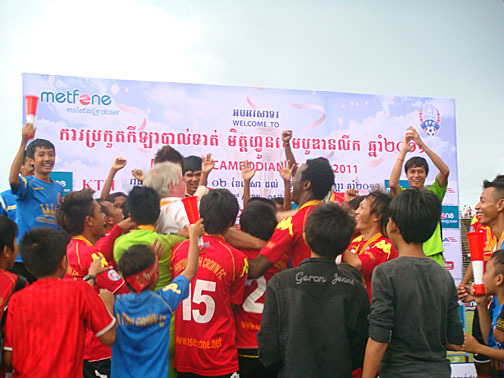 A great day for all, especially youth football in Cambodia. The PPCFC2 squad, who finished top of the table after the round-robin matches. Back Row LtoR: Baraing, K Chhaya, Ronaldo, S Samnang, Sovann, Titchhy. Front Row: Piphop, Phearath, Noeut, David, Ponvuthy, V Samnang. The PPCFC1 squad, who'll meet their Academy colleagues in tomorrow's final. 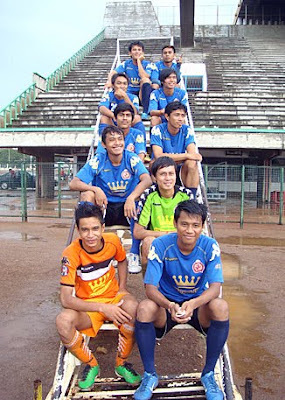 Back Row LtoR: Sovannaroth, Sakrovy, Chanpolin, Sopheak, Senteang, Chanchav. Front Row: Rozak, Sodavid, Muslim, T Chhaya, Chansopheak. The two Phnom Penh Crown Academy teams coasted through to the final of the First State Gold Investment Cup after coming top and second in the round-robin matches that were played this afternoon. The final will take place tomorrow, Sunday, at 10am and will be screened live on TVK. 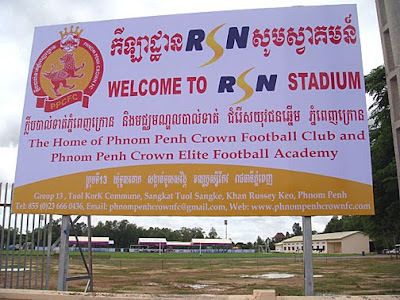 The venue is the RSN Stadium in Tuol Kork. In fact the team registered as PPCFC2 finished in top spot with 10 points from 4 games after putting one over the PPCFC1 team in the very final match of the afternoon. They won 1-0, with Ouk Sovann scoring, much to their obvious delight at the final whistle as they threw their shirts into the air and danced around like they'd won the FA Cup. 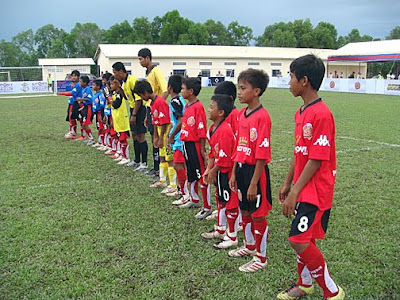 The competition was for 7-a-side teams of players who were thirteen years old or younger, and played on reduced sized pitches. 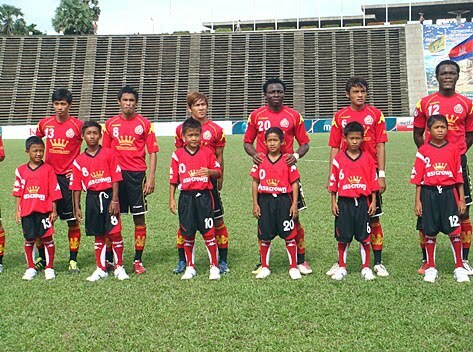 The International Soccer Academy from Singapore made the trip though the two Vietnam invitees pulled out at the last minute. Empowering Youth Cambodia organisation in Phnom Penh filled in one of the vacant spots, joining with the U-13 Festival champions Cambodian Foundation Organisation from Kompong Chhnang, and the two teams from the Crown Academy. 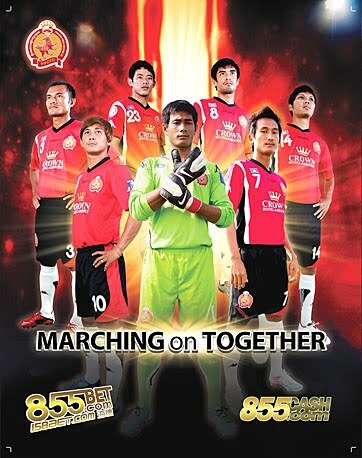 The day got underway with PPCFC1 beating CFO 2-0 with Phoeun Sopheak and Mat Sakrovy scoring. ISA won their first match 9-0 against EYC who found the opposition tough in all their matches. 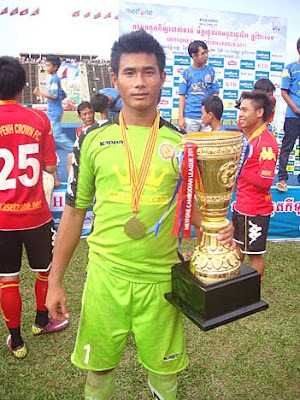 Sraing Titchhy netted a penalty as PPCFC2 did well to eke out a 1-1 draw with the taller ISA team. 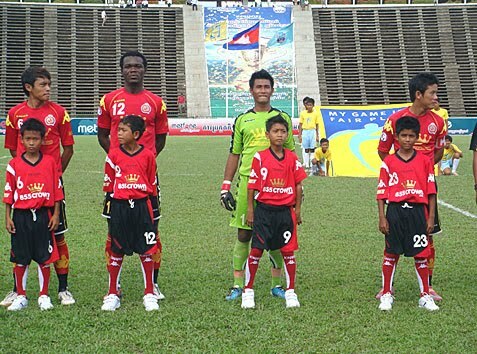 PPCFC1 then put 9 past EYC without reply, with Yeu Muslim scoring 4, Sakrovy 2, In Sodavid, Phoeun Sopheak and Ken Chansopheak 1 each. They then followed that with a 1-0 win in a close fought match with the Singapore Academy, Sopheak firing the winner through a forest of legs. 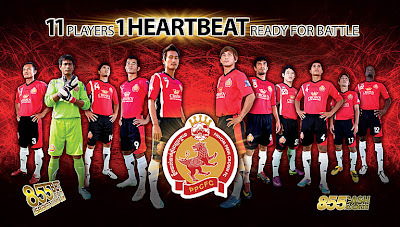 PPCFC2 came from behind to beat CFO 4-3 in a nail-biting clash. 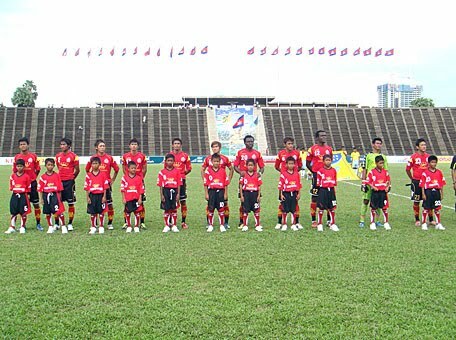 Ouk Sovann 2, Titchhy and Pov Ponvuthy scoring the goals. Another victory for PPCFC2 came with a 5-0 success against EYC. 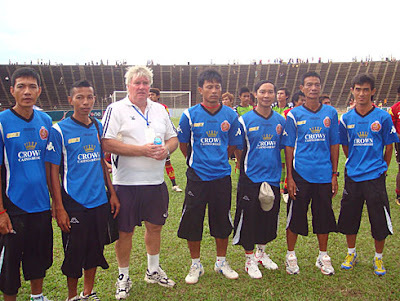 Vat Samnang and Long Phearath scored before Men Piphop fired in a hat-trick. To round off proceedings, the final match saw the two PPCFC teams face-off against each other, which was a dress rehearsal for tomorrow's final. Temporary bragging rights go to PPCFC2, who made sure their colleagues knew about the 1-0 win both on the pitch and at the after-competition dinner at Diamond Hotel later in the evening. Overall fabulous entertainment played in the right spirit by all the teams. This afternoon's match, on a totally soggy pitch at Olympic Stadium which made good football impossible and rendered the game almost meaningless, still counted as a good training exercise for Phnom Penh Crown as they prepare for next week's assault on the AFC President's Cup final round. It's typhoon season in Taiwan, so rain and soggy pitches might be the order of the day on the 19th when they play their first game at the Kaohsiung National Stadium. It began raining heavily an hour before the kick-off this afternoon and continued throughout the match, leaving large pools of water on the playing surface. However, that didn't stop the game going ahead, with Crown meeting Lee Tae-Hoon's Cambodian U-23 squad and giving them a 3-2 beating that will give the South Korean coach something to mull over. Crown on the other hand, played without their three regular foreign players, and led 3-2 at the interval, which signalled almost complete personnel changes for both sides, with no more goals coming after the break. 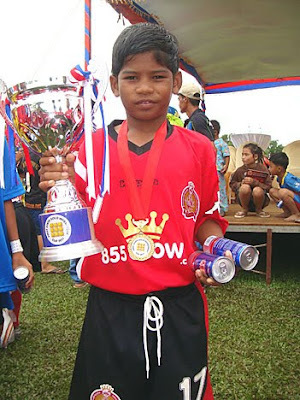 The only player to play the whole 90 minutes was Crown's Khim Borey, back from his season in the Thai Premier League with Sisaket and on hand to tap home the game's first goal on 8 minutes, after Sou Yaty failed to hold Sun Sopanha's 25 yard free-kick. Borey may've been playing in midfield but he's lost none of his goalscorer's instinct whilst on his travels. It was all Crown in the first-half and Kouch Sokumpheak fired one from distance straight into Sou Yaty's hands and then saw his curling effort tipped around the post by a flying Yaty save. On 20 minutes, Khuon Laboravy was gifted an equalizer for the U-23's when Sun Sovannrithy delayed and then mis-cued his attempted clearance. Borey fired in a 30-yard effort which Yaty saw late and fingertipped around his post before Tieng Tiny fizzed an effort across the face of goal after Sopanha's shot fell at his feet. Sun Sovannrithy made amends for his earlier blunder by powerfully heading home Sopanha's chipped free-kick after 28 minutes to restore Crown's lead. It lasted less than ten minutes when Laboravy swung a cross to the far post and Chin Chhoeurn's well-timed volley crept inside Peng Bunchhay's near post. 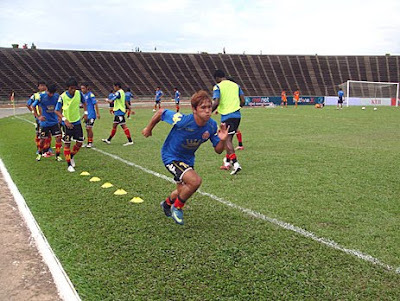 Yaty was in the right place to keep out Sok Pheng's swerving drive from thirty yards moments later. A minute before the break, Crown got their just desserts when Sovannrithy bounded forward to the byeline, touched the ball onto Chan Chaya and his left foot shoot was too hot to handle for Yaty at the foot of his near post. Crown went into the interval, 3-2 ahead though with bookings for Sovannrithy, Chan Dara and Sopanha. 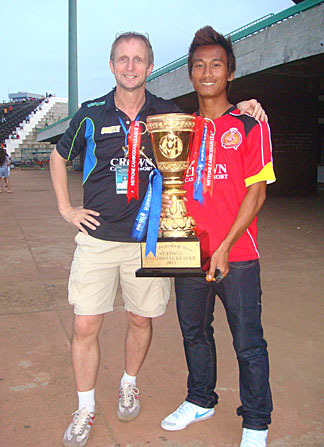 Both coaches made wholesale changes at half-time, with just Khim Borey surviving in the Crown line-up. The U-23s put out a new team and both line-ups effectively cancelled each other out for much of the second period. A shocking offside flag by the linesman ruled out a neat finish from Hok Sochivorn and Hong Pheng raced onto a through ball and around the keeper but screwed his shot across the face of goal with Crown's best chances. 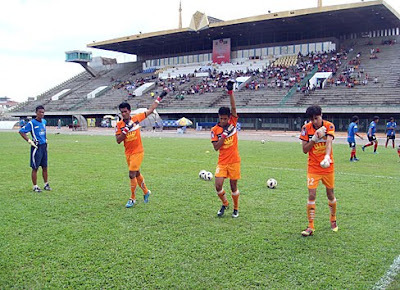 The last word went to Crown's stand-in keeper Hong Visokra who made sure his team went home with the bragging rights by pushing out a Sophal Udom drive in the closing seconds. Despite the conditions, it was a good work-out for the players who had their stamina tested, ahead of the AFC President's Cup for Crown and the BIDC Cup for the U-23s. Crown coach David Booth has another week of preparation before he and his squad head out to Taiwan for the exciting finale to their already successful campaign. 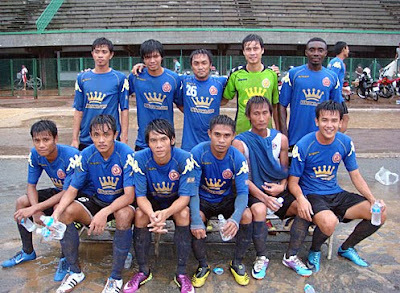 Crown: Bunchhay (Visokra), Dara (Sophanal), Sovannrithy (Vanthan), Tiny (Nwafor), Sothearith (Sovan), Narith (Sophat), Sopanha (Virak), Borey, Chaya (Ratana), S Pheng (H Pheng), Sokumpheak (Sochivorn). Subs not used: Bunna, Rathanak. Bookings: Sovannrithy, Dara, Sopanha. Cambodia U-23's: Yaty (S Sophea), Rady (Raksmey), Dalin (Pancharong), T Udom (K Vannak), Piseth (S Rithy), Sothearath (Chansothea), Phearith (O Kumpheak), Chhoeurn (Saray), Souhana (Soksana), E Vannak (Nasy (Sokly)), Laboravy (S Udom). Bookings: Kumpheak, Sokly. 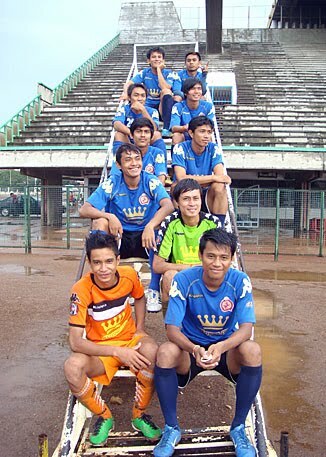 Time for a new poster, this time with 11 of the Phnom Penh Crown players lined-up. See how many you can identify. No prizes for getting all eleven players. 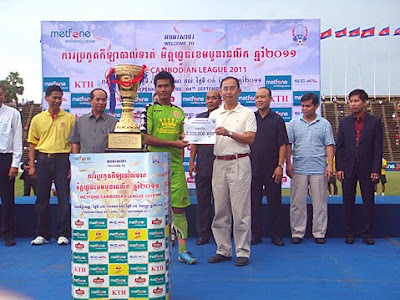 The next set of pictures are taken after the final whistle and before, during and after the presentation of the Metfone C-League Championship trophy to the Phnom Penh Crown team, alongwith their medals and cheque for $15,000. The presentations to individuals and the team in the first three placings took place on a stage at the center of the pitch and the VIP guests included the Minister of Sport, the city governor and the president of the football federation. The young boys you see in some of the pictures were allowed onto the pitch by the military police and as the cup was presented they all jumped up onto the stage, which should not have been allowed to happen. This was the players' moment, not the young boys, who should've been celebrating on the terraces with the other fans. PPCFC coach David Booth jokes with his players before kick-off. He wasn't joking at half-time. I have a few more photos from Sunday's action-packed afternoon including these pictures that were all taken prior to kick-off, both inside and outside the Phnom Penh Crown dressing room. For those who know no better, the dressing rooms at the Olympic Stadium might seem satisfactory but to be honest, they are appalling. Sunday morning park teams in the UK have better changing facilities than those at the Olympic Stadium. There are no showers, the fans are totally ineffectual and the rooms are like an oven, there are plastic chairs instead of benches, there is nowhere to hang your clothes, a crowd of faces look in through the windows as the players change, and so on, the list is endless. The 4th official, who should be checking for correct boots and kit, comes into the room to check each player has a jersey and that's it. Two teams who played the day before both had the same colour socks on, which is against the rules. 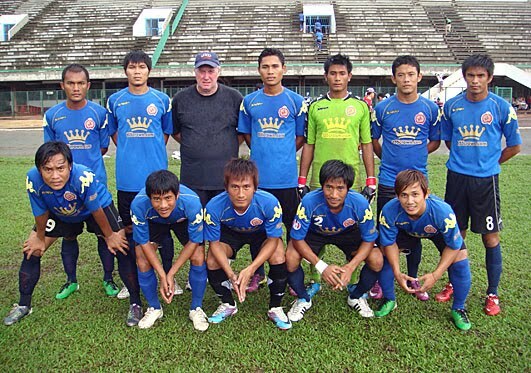 There is a long road to travel before football in Cambodia reaches even the most basic level of professionalism you find in a country like the UK. I know it's comparing apples and pears but we must strive to improve or continue to remain in the international football wilderness. 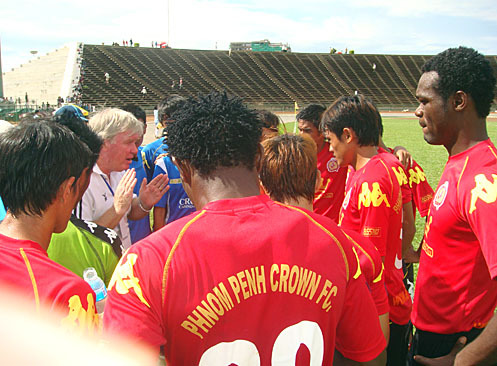 Even Phnom Penh Crown have much to do to improve. Take for example the playing kit. 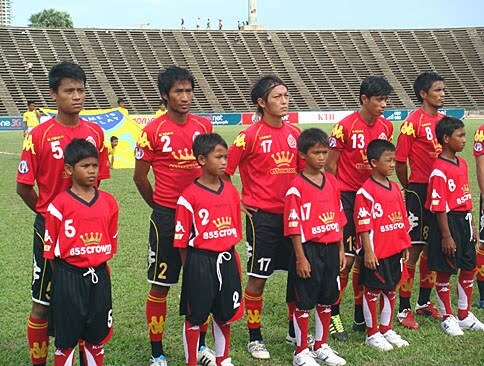 Up until now, each player takes home their own kit to wash and bring to the next game. I couldn't believe that when I first heard it. 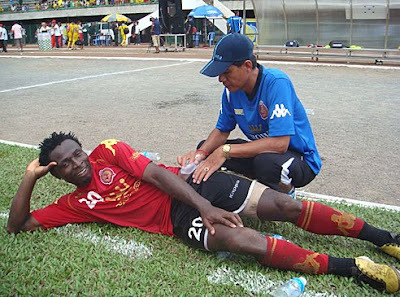 The players were also given the task of sewing on the CPL and Fair Play badges onto their sleeves, which resulted in all kinds of weird and wonderful badge locations. These are basic elements which we must change if we want to improve. If you think this is nitpicking, think again. Being professional in everything you do, starts with the smallest details. Skipper Sun Sopanha (right) asks the referee, "how much longer?" 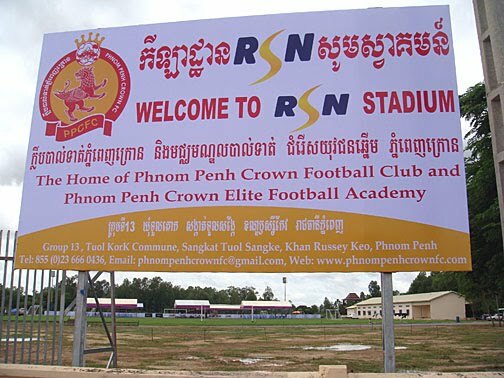 I had the opportunity to talk about Phnom Penh Crown with PUC Radio Talk Show host Soma Norodom last night during our hour and a half discussion that ranged from the football club, to sci-fi, to Vann Nath, to movies and much more in-between. 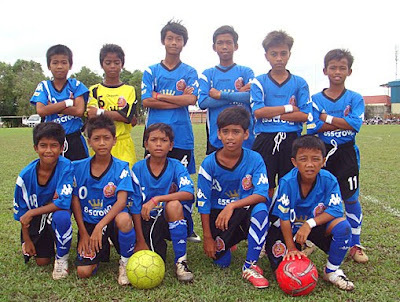 Soma was very keen to find out more about how Crown are trying to change the face of football in Cambodia, putting it on a much more professional footing, especially with the introduction of the full-time youth academy. 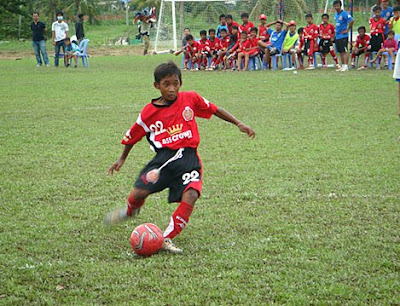 She's as keen as I am to see a big improvement in the development of sports amongst Cambodia's youth and the academy programme is a perfect example of this, providing quality skills coaching alongside focused academic development. She even offered to start-up a Crown cheerleader troupe. You can listen to Soma's nightly PUC radio show on 90.0FM. It doesn't get much better than this for Phnom Penh Crown'sstand-in captain Sun Sopanha, who took over the skipper's armband whilst Thul Sothearith was out through suspension. He collects the Metfone C-League Championship trophy from the Minister of Education, Sport & Youth, HE Im Sothy after Sunday's final match of the season. Two more of the large posters of the Phnom Penh Crown squad that have recently been produced and can be seen on the walls and outside windows of the Crown Sports Bar on Street 200. 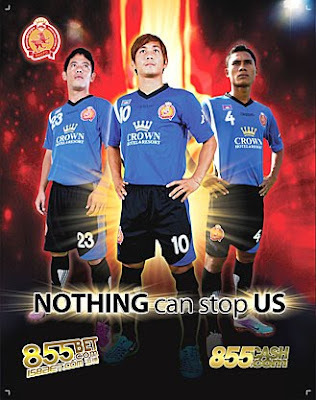 Another of the posters that can be seen depicting Phnom Penh Crown squad members at the Crown Sports Bar on Street 200. 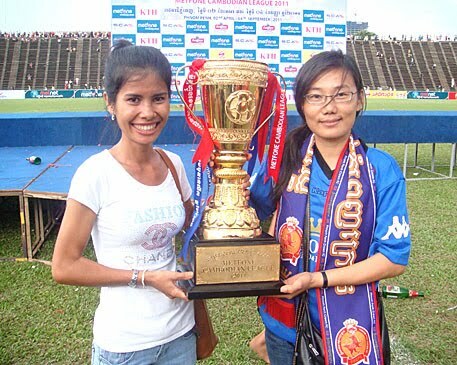 This one features Khim Borey and Kouch Sokumpheak. More to follow. BECOME A MODERN DAY PRO FOOTBALLER. HOW !